Julian Castro said the Romney-Ryan budget would "gut Pell grants." Paul Ryan's budget doesn't actually cut Pell grants, though it does prevent a scheduled increase in their maximum size and make it harder to qualify for them, the Washington Post points out. Castro also said that 4.5 million "new jobs" have been created under Obama. That's from an Obama campaign talking point, which starts counting in February 2010, and counts only private-sector jobs—not public-sector ones, which declined. Count them, and start in 2009, and the economy has lost jobs. 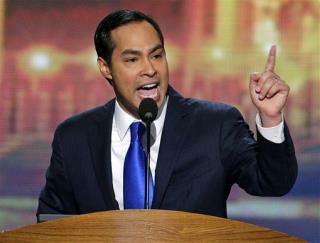 Castro said Romney would raise taxes on the "middle class." But FactCheck.org points out that Romney has promised not to do so—Democrats are basing the statement on a study that implied he would have to. Deval Patrick, Romney's successor as Massachusetts governor, said that by the time Romney left office, the state was 47th in job creation. It was 47th overall during Romney's term, but when Romney left office it was 28th—up from 50th when he was elected—and as PolitiFact notes, this stat, like many Romney stats, exaggerates an executive's influence on the job market. One union president said Romney had sought a "government bailout" for "his company." But FactCheck says Romney actually negotiated a "favorable but routine settlement" with bank regulators for a company he used to work at, and that no taxpayer funds were involved. Unfortunately for republicans they recently put a lot of effort into discrediting fact checkers, so if them and their followers are intellectually consistent this shouldn't matter. Now it's democrats turn to use the old "fact checkers won't dictate our campaign" line. Just watched Elizabeth Warren. Too bad she wasn't a top official of the former Soviet Union. She would have hastened its downfall. The Bureau of Labor Statistics says Romney's state only beat Michigan, Ohio and Louisiana in job growth from 2002 to 2006. And yes, that statistic includes both public and private sector jobs. Adding public state jobs which is increasing the size of government according to the Republicans is just what Romney did and the numbers are negligible. You know why Romney doesn't talk more about Romneycare and giving everyone in his state healthcare? It's because private health insurance companies share control of the Republican party. Pro-Lifers should know that Romney's Bain ran an aborted baby disposal factory.